Can Raf Simons Revive Minimalism? When last year the Belgian designer Raf Simons was finally officially appointed as the creative director of Calvin Klein, the American brand known for its minimalist aesthetic, the fashion world was elated, and those of us in New York doubly so. 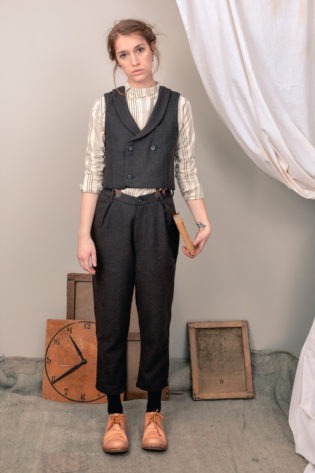 The New York fashion scene has long been starved of creative talent of Simons’s caliber. And while the departed and highly underrated Francisco Costa has quietly done a brilliant job at the helm of Calvin Klein’s womenswear, he was never given the sweeping authority to oversee the entire brand. Simons will be doing everything, including crafting Calvin Klein’s overall aesthetic direction. But whether this will be a glorious return to Klein’s own minimalism remains to be seen. The even bigger question is whether minimalism can remain viable today. Swiss model Anja Leuenberger and Spanish model Marta Ortiz exits the Cushnie et Ochs at Milk Studios on September 11, 2015 in New York City. Anja wears a black leather motorcycle jacket, and a black and white striped t-shirt, black jeans with a belt, and aviator-style sunglasses. 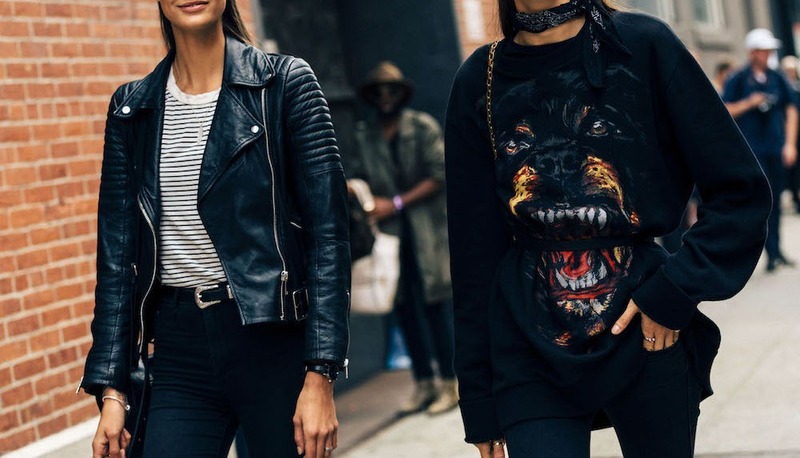 Marta wears black cat eye sunglasses, a black Givenchy rottweiler dog graphic sweater, and a black bandana around her neck. That contemporary fashion, especially that caters to the young, is now largely driven by Instagram is no longer a subject for debate. Instagram allows designers to speak directly to the audience not only through their work, but through their lifestyle. One of the first designers to recognize this was Ricardo Tisci at Givenchy. He also quickly began tailoring his faux-goth aesthetic towards being Instagram-friendly, abandoning subtle details embedded into the clothing in favor of graphic prints on t-shirts and sweatshirts. These were immediately recognizable, becoming a branding exercise that cleverly stopped short of logomania. These products became wildly fashionable and commercially successful, and the brand’s consumers did not seem to mind that some of those sweatshirts cost not much less than a tailored Givenchy suit. It did not take long for the rest of the fashion world to catch up to Tisci’s success. Hood by Air began putting together a New York version of what Tisci was doing in Paris and has quickly found commercial success. Then came the now ubiquitous Vetements, who began by building on the heritage of Martin Margiela, the minimalist par excellence, but quickly veered off into producing slogan-emblazoned sweatshirts. The case of Vetements seems especially egregious in catering to the consumer who craves Instagrammable fashion. If you look at the first two Vetements collections, you will hardly find a logo or a graphic in them. Those collections mostly concentrated on deconstruction and attention to seamwork and silhouette. 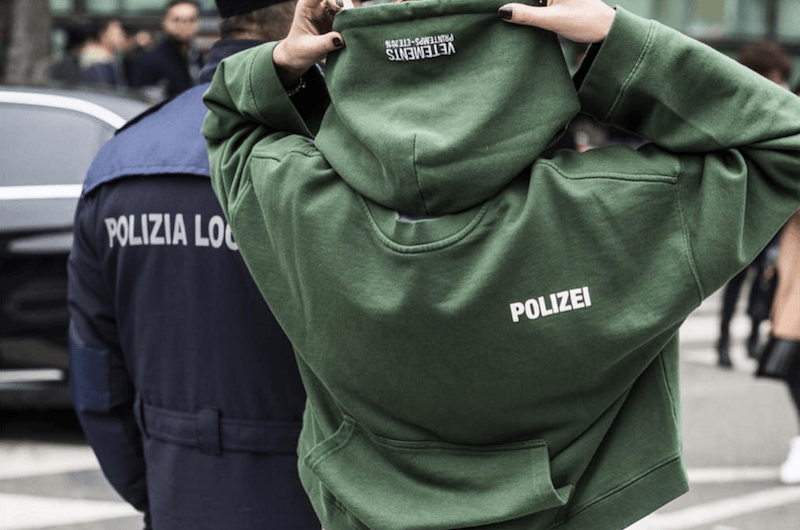 But after the brand’s ironic security jacket that said “Vetements” on it became its bestseller, the light bulb went on, and Vetements’s subsequent collections became heavy on graphics and slogans. The rise of the so-called “street style” photography has also been spurred by Instagram. Why I put “street style” in quotation marks, is because it’s no longer anything of the sort. Long gone are the days when “The Sartorialist” Scott Schuman rode his bicycle around New York City, trying to spot the sartorially interesting on the street. Today, an army of photographers mobs every single fashion show or event and the attendees spend countless hours carefully preparing for their grand entrance. 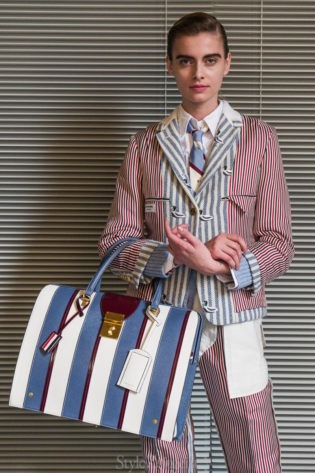 Advertising teams of fashion companies often influence what they wear. Spontaneity is out, status anxiety and marketing is in. None of this bodes well for minimalism, which concentrates on the subtleties of construction and careful attention to materials. Simply put, minimalism does not photograph well, and it certainly rarely looks good on Instagram. Black, the minimalism’s color of choice, does not translate well onto a low-resolution photo on your phone screen – you need a printed magazine page to appreciate its understated beauty in full. Minimalism in fashion came of age in the late 80s and had its heyday through the 90s and the early 00s. It is often said that the movement grew as a reaction to the flamboyancy and excess of the designers like Gianni Versace and Franco Moschino in Italy and Thierry Mugler, Claude Montana, and Jean-Paul Gaultier in Paris that dominated the catwalks for a good part of the 80s. Even though there were minimalist tendencies already present in the work of Giorgio Armani and Calvin Klein, these were not pointed aesthetic statements that minimalism’s champions like the German Jil Sander, the Austrian Helmut Lang, and his Belgian arch-rival, Martin Margiela, made. Fashion often reflects the zeitgeist, and it seems like the 90s was fertile ground for minimalism. There was the drive for understatement amidst the cultural elite in places like New York and London. If you were a gallerist, you wore Helmut Lang or Jil Sander. If you were the artist in the gallery, you wore Yohji Yamamoto. And there was hardly a successful architect who did not own a black Margiela turtleneck. Part of fashion, perhaps its best part, is the conversation between the designer and the wearer. That is what makes designer fashion stand apart from mere clothing. The designer, as any creator, has aesthetic intent, a message that he or she tries to carry across, and the hope is that the end consumer gets it. The minimalist clothes by the above-mentioned trio presented a certain intellectual rigor on the part of the designer, and a subtle but deliberate thought process. And by wearing the clothes the end consumer seemed to say that he or she understands that process. After all, the worlds of art and architecture have some of the same characteristics – a certain cultural maturity and sobriety, a fineness and finesse that is often lost on the masses. The elites spoke to each other through messages coded in the four stitches of Margiela’s label barely visible on the upper back, and they only needed to impress each other. Today, thanks to the social media everybody constantly needs to impress everybody else, a task formerly reserved for celebrities whose default job was to cater to mass taste. Social media, and Instagram in particular unleashed the forces of narcissism that are latent in all of us. Everyone potentially has a chance to become a celebrity with one’s own, easily quantifiable fan club, or so the popular thought process goes. This, of course means that the competition for attention is fierce and the adage “whoever shouts loudest wins” seems to be carrying the day. For fashion such a climate spells the death of minimalism. 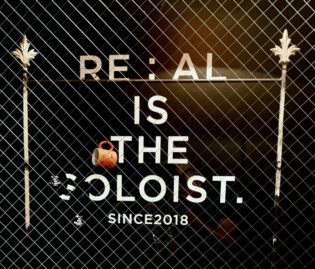 There has not been a successful minimalist brand in recent memory. 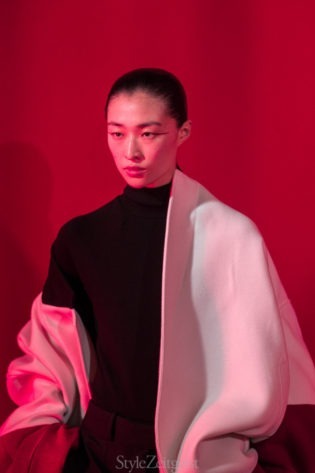 The last influential designer who has some minimalist tendencies is Rick Owens, and many of the fans of Helmut Lang, who departed his own brand in 2005, have migrated over to his work. But Rick Owens could hardly be called a minimalist in the pure sense of the word, though his work largely eschews graphics and often relies on black and gray color. 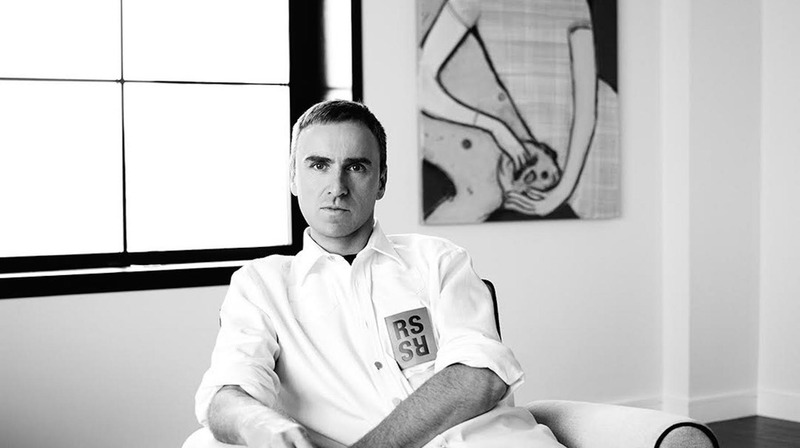 What then should we expect from Raf Simons at Calvin Klein? 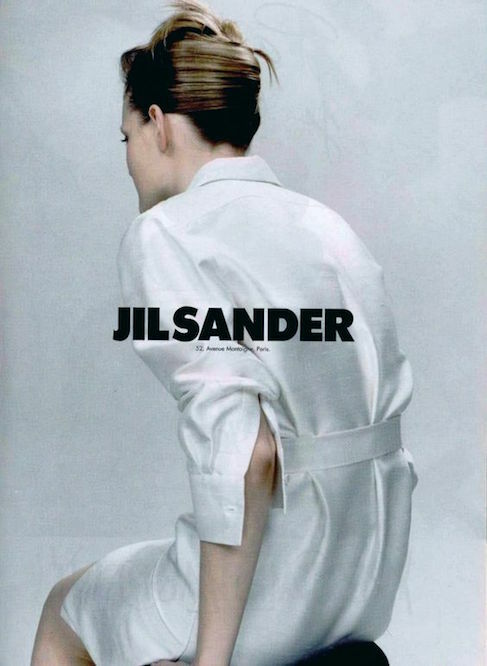 Simons is no stranger to minimalism, having helmed the Jil Sander brand for several years after Sander herself sold the brand to Prada and subsequently left. And though there always has been a graphic element present in Simons’s own men’s line, it was his razor sharp tailoring rendered in slim silhouette that made Simons the darling of the fashion avant-garde of the last decade. Whether this line of design thinking is viable today remains to be seen.